Rama or Ramachandra is the seventh avatar of Vishnu in Hinduism, and a legendary king of Ayodhya in ancient Indian mythology. Rama is one of the many popular figures and deities in Hinduism, specifically Vaishnavism and Vaishnava religious scriptures in South and Southeast Asia. Most of the details of Rama's life come from the Ramayana, one of the two great epics of India. Born as the eldest son of Kausalya and Dasharatha, king of Ayodhya, Rama is referred to within Hinduism as Maryada Purushottama, literally the Perfect Man or Lord of Self-Control or Lord of Virtue. Rama is the husband of Sita, whom Hindus consider to be an avatar of Lakshmi and the embodiment of perfect womanhood. link: http://en.wikipedia.org/wiki/Rama - Rama the incarnation of Vishnu. 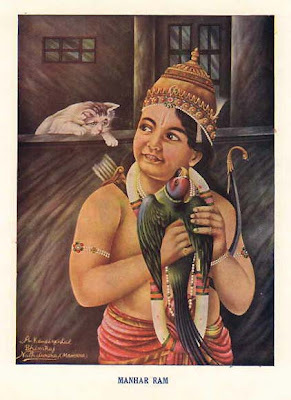 link: http://www.harekrsna.com/gallery/pets1-gallery.htm Image of Rama.